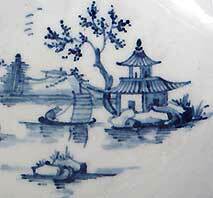 In the 17th and early 18th century most of the wealthy had some blue and white Oriental porcelain. When the English manufacturers produced porcelain it was natural for them to turn to these examples for inspiration in shape and decoration. Worcester blue painted wares sold at a reasonable price and became very popular. This great and overwhelming demand lead the factory to experiment in printing. By the 1760's printing had been perfected and enabled Worcester to offer blue and white wares in larger quantities and at prices that competed with Chinese Export porcelain. 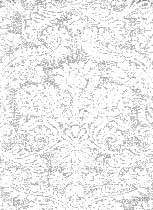 To date over 320 different patterns have been recorded over the forty years of production. For collectors this has provided a rich field of porcelain to explore and the diverse types of designs has lead to many interesting collections reflecting their owner's focus. Worcester Blue & White Porcelain 1751-1790 by Branyon, French and Sandon. All are First Period (Dr Wall) to 1783 unless attributed to another maker. BOWL. height 3 inches, diameter 7-1/4 inches. Painted with the "Rock Strata Island" Pattern. From the Ruby Brown Collection. A lake scene showing a house on a rocky island, the reverse with two boats in front of an island. Minor rim chip professionally restored. Section of interior border flowed in the making. MUSTARD POT, 2-3/4 inches high. Decorated in the "MANSFIELD" pattern. Bowl, 5" diameter, BLUE & WHITE, painted "Waiting Chinaman" pattern. Mark: Underglaze blue small open crescent. BOWL. 2-3/4"high, 5-3/4"diameter. Blue & white. Printed "Birds in Branches" pattern. Reverse with birds in flight. TEA BOWL. 1-3/4"high, 3-3/4"diameter. Blue & white. "Chrysanthemum" molded pattern. Molded in low relief with intricate design of flowers and foliage. Interior with a chrysanthemum and a lambrequin border. BOWL. 2-1/4"high, 4-3/4" diameter. Blue & white. Printed "Fisherman & Cormorant" pattern. Interior with three rocks and cell border. BOWL, 3" high. 5-3/4" diameter. FEATHER molded with painted blue flowers. Crisply molded. Interior with floral spray and flower & leaf border. BUTTER TUB, 2-3/4 high, 4-1/4 diameter. Blue & white. Printed "Fence" pattern. PLATE , 8 inches diameter. Blue & white. Lobed rim. SMALL JUNKET DISH, 8" diameter 1-1/2" high. Molded with spiral flutes. White body with underglaze blue and overpainted gold design. TEABOWL & SAUCER, 1-3/4"high, 4-3/4"diameter. Fluted shape with a gold dentil rim. White ground painted with bright blue (dry blue) flowers. *old restoration to small chip on rim. TEABOWL & SAUCER. BLUE & WHITE. Bowl 1-3/4" high, saucer 4-3/4"diameter. "Chrysanthemum" molded pattern. Molded in low relief with intricate design of flowers and foliage. Blue diaper and petal borders. COFFEE POT, 7-3/4 inches high. Blue & white. TREMBLEUSE CUP & SAUCER. BLUE & WHITE. Cup , 2" high, saucer 5-1/2" diameter. Molded with narrow ribs. Painted blue lambrequin border. DO YOU NEED A LID? SMALL LID. 2-1/8 " diameter. Interior diameter 1-3/8"
LARGE MUG, 5-1/2" high, ,"Gilliflower Pattern ". Straight cylinder form, strap handle, blue rim. Printed with blue flowers and butterfy. SMALL BOWL, 2" high , 3-3/4" diameter. Painted in the "Cannonball"pattern, with a house and trees by a large rock. In the foreground and the interior are the strange round rocks that give this pattern its name. PORTER MUG, 5-3/4"high , BLUE & WHITE, cylinder shape slightly flared top and bottom with grooved strap handle. Decorated in blue with two large bouquets. WALL POCKET, 11-3/4 inches long. In the shape of a cornucopia. Painted in underglaze blue with "PRUNUS ROOT " pattern. The body is spirally molded. The back pierced with two holes for hanging. Mark; in inderglaze blue crossed swords. SAUCE BOAT, 7-1/2 inches long. "THE TWO HANDLED SAUCE BOAT " pattern .Silver shape molded with a floral design and reeded spouts. The interior painted in underglaze blue with an Chinese river scene with a boat, the lips with flowers and a diaper panel. Mark; workman's mark in blue.